17dBi, 2.4-2.5 GHz Outdoor Sector Panel WLAN Antenna with 120 Degree coverage, and N-type Female connector for 802.11B/G/N Access Points. Includes U-Bolt Scissor Brackets for Pole Mount and down tilt adjustments. The added signal strength and sensibility that comes with this Outdoor 17dBi Sector Antenna will make your Wireless Installation easier and more secure. Mount this 2.4GHz Sector Antenna on top of your building, Marina, RV-Park or Hotel, and tilt it towards the desired coverage area for a great signal, and excellent Wireless Coverage. Mounting Hardware is included as well as basic Technical Support to get you started on your Wireless Installation. This 17dBi Sector Antenna works great in Point to Multipoint solutions as well. Simply Mount the Outdoor Sector Antenna in pairs to create a 240° of Coverage, or in a set of Three, to create 360° of Coverage. 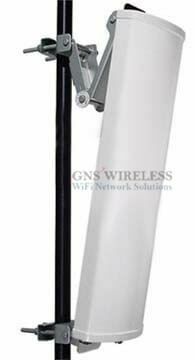 You can also use the 17dBi Sector Antenna as a single, stand-alone Antenna for the desired 120° of coverage. Range estimates for RV Parks, Campgrounds, Marinas, etc., will be considerably less, as the distance will depend on receive sensitivity of Access Point, and quality of laptop. The more obstructions in your application, the shorter the range. To compensate for this loss, it is recommended to add additional Access Points throughout the area, (repeaters). This will increase the signal strength to end users. For the best results, this Outdoor 2.4GHz Sector Antenna should be used in situations where you have Line-of-Sight to the client locations. 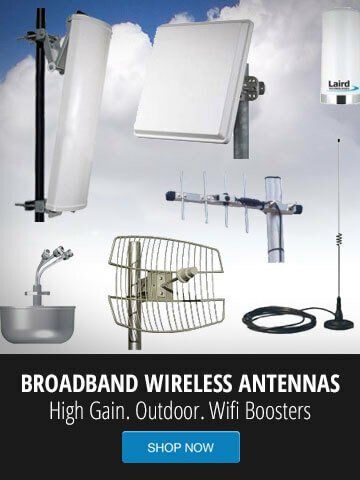 Please contact us if you have questions about your setup, or need higher gain, outdoor Antennas. Mounting 2 inch (5 cm) O.D. max.